This aside offers, in the way of a reminder, a few points previously presented, beginning with the short video explaining how the tutor taught me to solve the enigmatic formula of my dreams. Solving the formula with my tutor only got me so far: -1 (a² + b²). By the end of the first chapter in this unit, we were left without knowing the values of the variables ‘a’ and ‘b’. In the chapter Discovering Portals between Our Dual Dimensions we discovered a pair of peculiar numbers with profound implications, 1.618 and .618. Called Phi and phi, respectively, these numbers are irrational, meaning their decimal places continue indefinitely without repeating any pattern, though their decimals have been truncated at the thousandths place for the purposes of this chapter. Only these numbers, and their exponential progressions, can link the holarchical dimensions of Parts to Particularity, and Particularity to Participation! This being as good a reason as we could find, we made these numbers our variables. The solution, -1(3), kinda fell flat at first. Why, of all possibilities, would the answer to the $64,000 question be -1(3)? 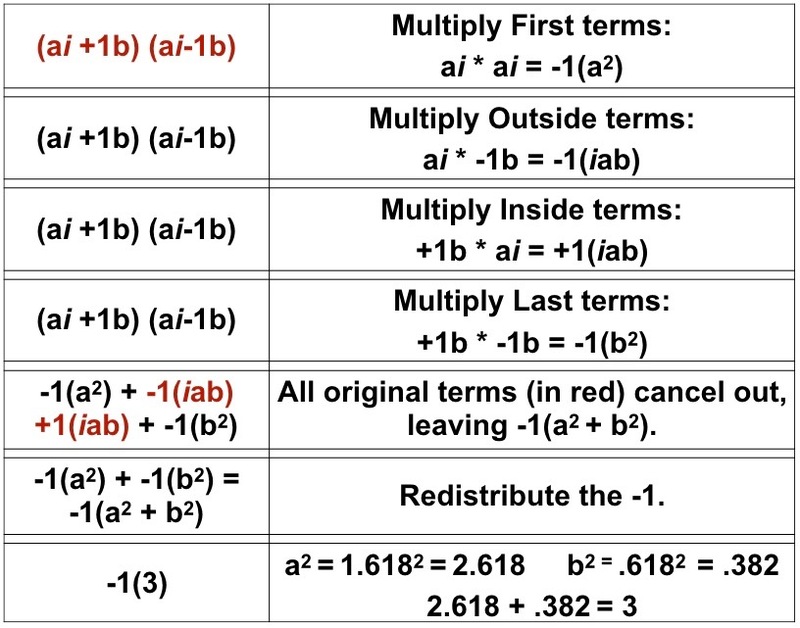 From the beginning though, it was intriguing that all the terms in the formula (seen in red above) canceled out; and yet, a non-null solution was forthcoming. Was this formula telling, in mathematical terms, how Something comes from Nothing?